Akai and Ableton have collaborated on the APC40, to bring tightly integrated, hands‑on control to Live. Perhaps the most talked‑about new piece of music technology this year, Akai's APC40 is a dedicated hardware controller for Ableton's Live software. 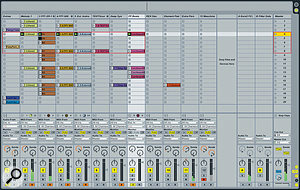 The APC40 was co‑developed with Ableton and bears both company's badges. As a result, it enjoys tight integration and navigation within Live's user interface. 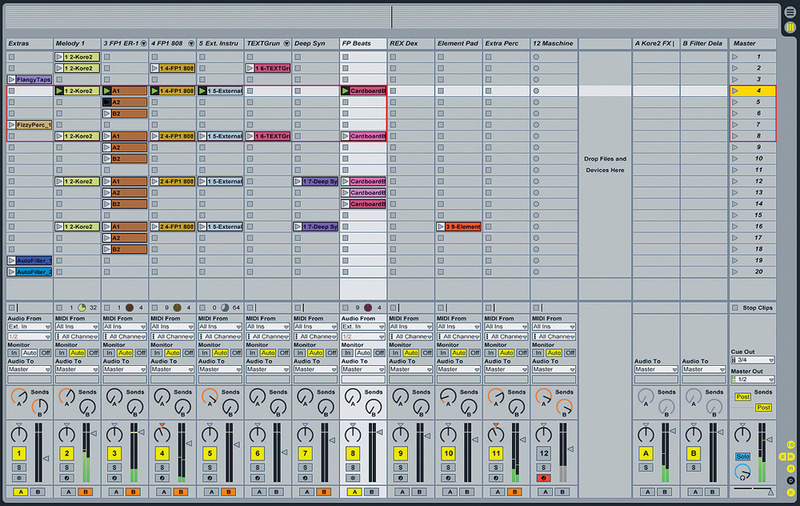 The APC (Ableton Performance Controller) controls Live's mixer, devices and transport functions, but the key feature is the Clip Launch matrix, which offers mouse‑free orchestration of Clips and Scenes in Live's Session View. The APC ships with a copy of Live Lite, but I imagine most people will use it with a full version of Live 7 or 8. The APC40 is smaller than I expected (which is a good thing), being exactly the same width as my Apple keyboard. It feels gig‑proof, and the crossfader is a user‑replaceable module that bolts in from the bottom of the unit. Connection to the host computer is via USB (there's no old‑school MIDI output), and the APC's light show necessitates a mains connection from a low‑profile external PSU. A very useful addition is a pair of footswitch inputs, one of which defaults to triggering the selected Scene, while the other launches or punches-in the selected Clip slot. Once the APC is connected and enabled in Live, a red rectangle appears in Live's Session View. Clip slots within this zone are targeted by the 8x5 button grid on the APC. Pressing a pad on the grid launches the corresponding Clip in Live, while triggering an empty slot on an armed track starts a new Clip recording. The buttons light up in different colours to indicate the status of the slot they control. Orange shows the presence of a Clip, green represents a playing Clip, red shows a Clip being recorded, and if there's no light, that means the slot is empty. Below the grid is an extra row of buttons that stop playback on each track. To the right is a column of Scene Launch buttons that trigger entire rows of Clips, plus a Stop All Clips button, just like the Master Track in the software. The APC is not limited by its 8x5 button grid to eight tracks and five scenes. Bank Select buttons to the right of the pads nudge the grid around the Session View one row (up/down) and one track (left/right) at a time. The bank keys (like all the buttons on the right‑hand side of the APC) are hard and clicky, and not great for fast clicking around, so I found myself wishing they'd used the same rubber buttons as the grid, or that you could hold the buttons for continuous scrolling. Luckily, holding down the Shift key while 'banking' navigates in steps of eight tracks or five Clips. Additionally, while the Shift key is held down, the button grid changes to show an overview of the session, with each pad representing one bank of eight tracks and five Scenes. In this mode, the current bank is shown in yellow; other banks that contain Clips or tracks are red, and a bank containing Clips that are playing lights up green. Pressing a pad while in this mode immediately moves the APC's focus to that bank. The Scene Launch buttons extend the overview to five pages, giving a total area of 64 tracks by 125 scenes that can be navigated in this way. Up to six APCs can be used at the same time, each of which is represented in the Session view by a different-coloured rectangle. This offers some interesting possibilities for collaborative performance using a single Live Set. The red rectangles show what the APC's controls are currently focused on in Live's Session View. Below the pad grid, the APC continues to mirror Live's Session View, with Activator (on), Solo/Cue, and Record Arm buttons, and a fader for each channel. The faders won't replace nice touch‑sensitive, motorised ones that you might have on a studio mix controller like a Mackie Control, being more like DJ mixer faders, designed to be chucked around without too much precision. In fact, I noticed that the channel faders and crossfader have about 4-5mm of travel at each end where they don't do anything, which is a bit odd. 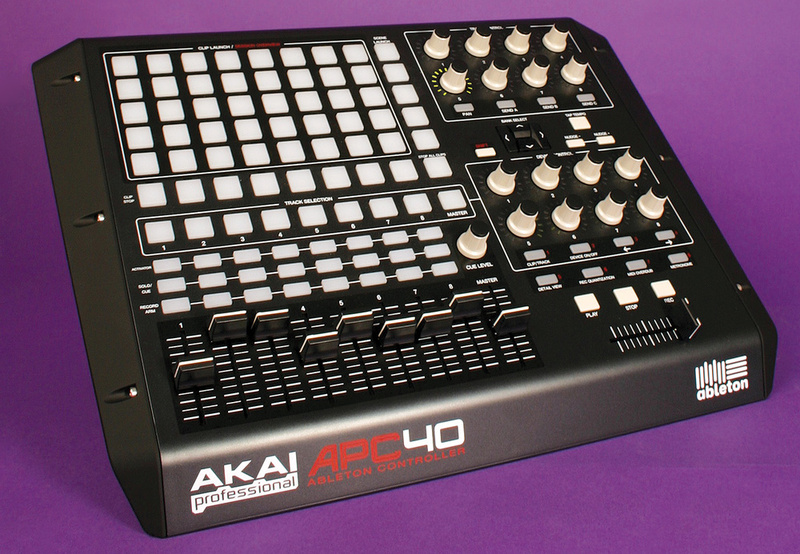 The APC40 breaks away from mimicking the software user interface with the Pan and Send pots. Rather than appearing in the channel strips, these eight endless encoders are grouped at the top right of the control panel. Four mode buttons switch the knobs between Pan and Sends A to C. The encoders are ringed with 15 LEDs to ensure you always know a parameter's value as you switch between different modes. I'm not sure why Akai have decided to detach the encoders from the channel strips (it may have been a practical board-design issue), but as someone who would rarely use these controls, I appreciated them being out of the way of the buttons. For those who use Live to emulate a DJ mixer workflow, the channel Cue buttons, Cue Level knob and crossfader will be essential features. Unlike the channel faders, the crossfader has loose tracking for quick fades. Not included on the controller are Live's A/B routing buttons, which you use in conjunction with the crossfader, and this means sticking to the routing you set up before a performance, or reaching for the trackpad. The remaining bank of eight knobs is dedicated to controlling Devices, which can mean Live's built‑in effects and instruments, or plug‑ins. As with other controllers that hook into Live's controller API (as opposed to generic MIDI controllers), any Device that is selected in the software instantly maps to the knobs. There are two big advantages with the APC40, however. Firstly, the hardware has everything you need to navigate between any Device in Live, removing the need to select with the mouse (there's one exception: devices on Return tracks). Track Selection buttons on the channel strips let you navigate to a track whose Devices you want to control, then left/right buttons move focus between Devices on the track. There's even a button that toggles between Clip and Device view. The Device section is particularly successful when using Live's Rack device, which provides a shell for groups of other devices and plug‑ins. This is because Racks have eight Macro knobs for controlling key parameters, which are laid out in the same way as the APC's Device Control encoders. However, when controlling any other Device or plug‑in, there's a lack of visual feedback about which parameters are being controlled. This means you either have to learn how the controls are mapped, or wiggle the knobs and see what moves. On a complex device with several banks, this can be a pain. Hopefully, a future Live version may feature something like Pro Tools' coloured boxes around parameters, to show what's currently mapped. While I'm writing my wish list, a button to open a plug‑in's interface would be nice, and another to open a Rack to show the internal devices. Having said that, there's a reasonable chance that the upcoming Max For Live will make it possible to create this kind of custom functionality for yourself (see the 'Taking It To The Max' box). For the most part, the APC40's preset functionality will be sufficient. However, if necessary, you can override any control on the surface and map it to any parameter that is available in Live's Edit MIDI Map mode. For the knobs, this doesn't break the banks, so a control that is overridden in the Pan bank will not affect other banks. This means you could, say, remap the Send C bank (which you're unlikely to use) to an important effect rack on your Master that you use all the time. As another example, I reassigned the Cue Level knob to scroll through the Scene list. The rear panel hosts the unit's two footswitch inputs, a USB port and a socket for the external power supply. A few months have passed since the release of the APC40, and it seems to have been received with near-universal enthusiasm. I can't argue with the consensus. The APC40 is elegantly simple, yet it makes a big difference to the Ableton experience. In addition to the brilliant Clip grid and mix controls, the designers have done a great job of choosing just the right things to include, both for recording 'beats' in the studio (MIDI Overdub, Rec Quantise, and so on) or playing/DJing live (Tap Tempo, Speed Nudge and everything else). Just being able to manipulate multiple Clips simultaneously, and drop Clips into and out of record without having to fumble around for the mouse is a quiet revolution. I also love the Device Control functionality, which is the first hardware implementation I've used in Live that doesn't feel awkward or rely on some mouse input. If some visual feedback can be added to show what's mapped, it will be perfect. Summing up, then, whether you use Live for performance or for studio composition and production, the APC40 comes highly recommended. There's nothing that does quite what the APC40 does straight out of the box, but there are options if you're prepared to work out your own mapping and controls. The Monome controllers (the 64 model, in particular) are completely open, but only have buttons, are more expensive, and require setting up to get them to work with Live. The Livid Ohm 64 has faders as well as buttons and is more configurable than the APC (until Max For Live arrives), but is twice the price and less integrated. The Faderfox Micromodul is cute but, again, lacks that out‑of‑the‑box integration. One of the most exciting prospects for the APC40 is integration with the upcoming Max For Live add‑on. Akai Pro have already revealed that Max For Live users will be able to edit the APC's preset functionality. The official video on Ableton's site also has a teaser for a patch that turns the pad matrix into a step sequencer. In the meantime, a few people have been developing ingenious hacks to add custom functionality to the APC that give an idea of some of the possibilities. These mainly use an intermediary application, such as Bome's MIDI Translator, to intercept the messages coming from the APC and turn them into other messages or keystrokes. Examples include Mackie Control emulation, use of the pads to play Drum Racks (although the APC40's pads are not velocity sensitive), and an emulator for the Monome controller. 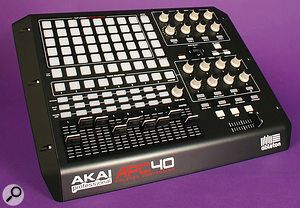 Although the APC40 is primarily designed for Live, it still communicates mostly via regular MIDI messages. It's also a class-compliant device, so other apps can see it and use it with no additional installation. I tried it with Reason and Pro Tools. Reason was able to map parameters to the APC's controls using Remote Override mode, and Pro Tools plug‑ins with a MIDI Learn function could also be controlled. The encoder banking functionality is not available outside of Live, so you can only map one assignment to each knob. Also, communication is one‑way, so the APC won't update to reflect on‑screen parameter changes or automation. A problem in both apps was that the APC's mixer strips and pad columns use a common set of CC and Note messages, with each strip sent on a different MIDI channel. Neither Reason or the plug‑ins in Pro Tools pay attention to MIDI channel in this context so, effectively, you can only use one fader strip and column of pads. This kind of issue could be resolved with a proper template or codec for the app, but Akai have stated that they will not be developing any such templates for third-party apps. That's not to say that someone else won't do it. You can't edit the messages that the APC puts out (which would allow you to emulate a Mackie Control or HUI, for example). However, as I've mentioned in the box on the previous page, people are already coming up with some clever hacks. You can control multiple Clips simultaneously and select and control all devices/plug‑ins from the surface. It's easy to drop Clips in and out of record. Thoughtful selection of transport and mode buttons provided. It will gain many new features when Max For Live is available. No indication of which parameters are mapped in devices/plug‑ins. Offers limited functionality with other applications. The APC40 is the missing link that turns Live into a true performance instrument straight out of the box. Email via Akai web site. Apple iMac 2.4GHz Intel Core 2 Duo, 3GB RAM, Mac OS 10.5.4.